Brand new oak barrels are about as sanitary as they can be because the wood has been heated over direct fire in the process of making the barrel. This is done in order to bend the staves into place, and also to enhance various flavor accents (such as vanilla and caramel). Like any wooden container, however, a new barrel must be filled with water to make the wood swell and eliminate leaks. These leaks will often seal themselves in only a few hours, or a couple of days. However, the barrel should be continually refilled until the leaks stop, and the water should be changed each day to prevent off flavors caused by rancidity or mold growth. It is recommended that an acidic environment be created in a new barrel, which is about to receive wine for the first time. Dissolve in water two teaspoons of Citric Acid for every five gallons of barrel capacity. Fill the barrel and check to make sure it is properly sealed. Then drain the acid water and fill the barrel with wine. 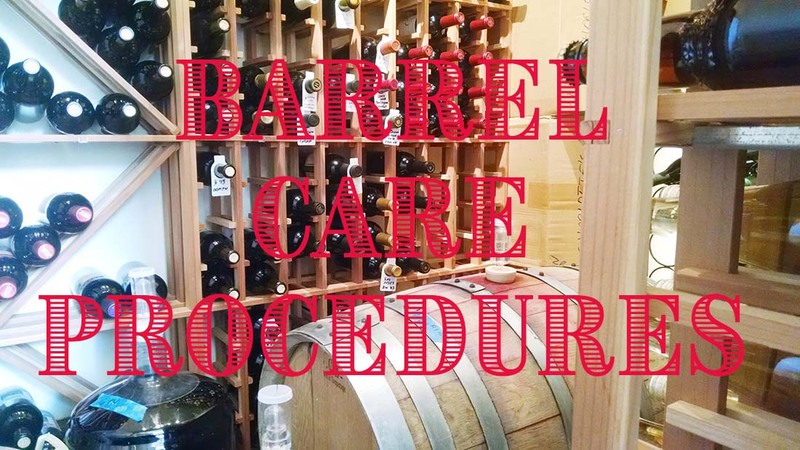 Once a barrel has been used for wine storage, additional cleaning and sanitation measures are required. At each racking, rinse the barrel thoroughly with water to remove debris. Follow by rinsing the barrel with an acid wash. Dissolve two teaspoons of Citric Acid in five gallons of water, sloshing this mixture around the interior surfaces of the barrel for 5 to 10 minutes. Drain, and refill the barrel with wine. It is always best to keep a barrel full of wine. When this is not possible, start by removing the organic matter that has penetrated into the surface of the wood. This is done with a solution of Proxycarb, a peroxide based cleaner. Use 4 oz. of Proxycarb for every 15 gallons of barrel capacity. Dissolve in a small amount of water, and funnel the mixture into your barrel. Fill the barrel the rest of the way with water. You may leave this mixture in the barrel for as little as 20 minutes or as much as 24 hours. If the barrel has VA (volatile acidity), double the amount of proxycarb and leave for 24-48 hours. Drain and rinse the barrel several times with water. Re-acidify the barrel using one ounce or one tablespoon of Citric Acid for every five gallons of water. Slosh this all around and drain completely. Next, prepare the barrel for either long term, or short term, storage. If it will be more than two months before the barrel is used again, drain the barrel and burn a Sulfur Strip in it, hanging it down at least 6 inches below the bung on a wire. Remove the Strip after about 15 minutes, and bung the barrel tightly. Burning sulfur releases sulfur dioxide gas into the barrel’s interior. Repeat every two weeks (as needed) until a flashlight reveals no shiny dampness in the bottom of the barrel. Bung up the barrel and store it in a dry place until needed, allowing enough time to soak up the barrel before use. If it will be two months or less before the barrel is used again, drain the barrel, and fill with a “Sulfite” and Citric Acid solution. Use four teaspoons of Potassium or Sodium Metabisulfite powder, and two teaspoons of Citric Acid for every 15 gallons of barrel capacity. Add enough water to fill the barrel, and bung the barrel tightly. Remove the bung every week or so and smell to make sure sulfur can still be detected inside the barrel, replacing the solution if necessary. Rinse the barrel with water before refilling with wine.